Certificates: all three courses are not official Stanford courses, though the instructors send a “Statement of Accomplishment” after satisfactory performance and completion of the course. I guess that with time more institutions will go towards this model. I even think that official certificates will be delivered for these kind of online education. 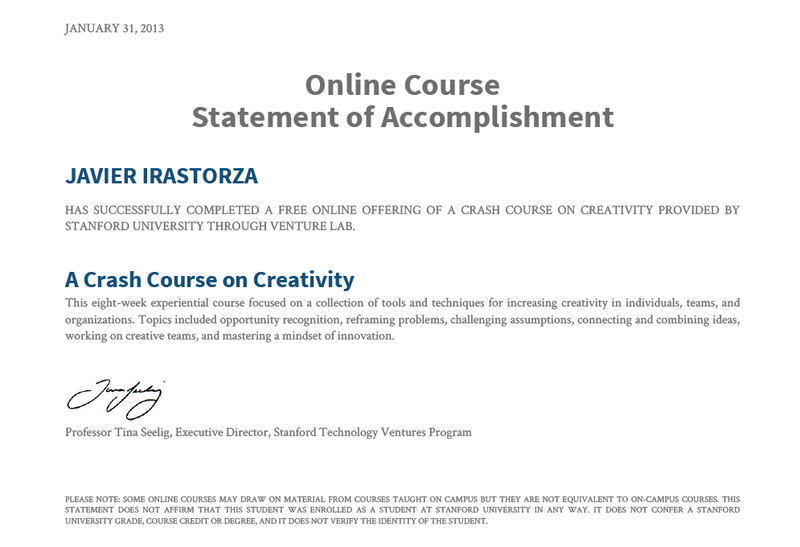 Statement of Accomplishment of “A Crash Course on Creativity”, Stanford University Venture Lab. PLEASE NOTE: SOME ONLINE COURSES MAY DRAW ON MATERIAL FROM COURSES TAUGHT ON CAMPUS BUT THEY ARE NOT EQUIVALENT TO ON-CAMPUS COURSES. THIS STATEMENT DOES NOT AFFIRM THAT THIS STUDENT WAS ENROLLED AS A STUDENT AT STANFORD UNIVERSITY IN ANY WAY. IT DOES NOT CONFER A STANFORD UNIVERSITY GRADE, COURSE CREDIT OR DEGREE, AND IT DOES NOT VERIFY THE IDENTITY OF THE STUDENT. Would that stop you from taking a course? If you had not completed some other studies before: would you go for these courses? Would you build your student records based on this kind of certificates? Hi Javier! Good post! I wanted to give you my opinion in some of your questions. I actually arrived to your post because I wanted to know how these certificated looked like. I registered for a couple of courses that start next month and I’m really excited about it. I think these free online courses might be worth doing, especially to expand your knowledge on a topic or just learn about something completely new. Hopefully you will be able to use this new knowledge in your regular studies program or at work. I believe they represent a new and flexible way to study. I also think employers should consider that people taking these course are actively trying to learn and that is a good thing! Now, I don’t think they can substitute all formal education. I believe a formal study program has structure and possibly much more feedback from your instructors. Anyway, I say YES! Take them!, YES! Employers should encourage them! mmm no, they should not replace (as they are now) all formal education. Other forms of online learning are better suited for that. by Chuck Eesley, Stanford University. I have question – when and how you received this certificate? After closing all of tasks?